Francis II becomes the first Emperor of Austria. Francis II, the last Holy Roman emperor of Austria. 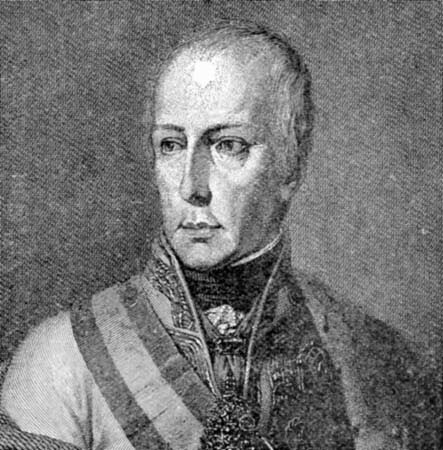 He supported the conservative political system of Metternich in Germany and Europe after the Congress of Vienna. Son of the future emperor Leopold II and Maria Luisa of Spain, Francis received his political education from his uncle, Emperor Joseph II, who disliked his nephew’s unimaginative outlook and stubbornness but praised his application and sense of duty and justice. Ascending to the throne on the death of his father in 1792, Francis inherited the problems raised by the French Revolution. An absolutist who hated constitutionalism in any form, he supported Austria’s first coalition war against France, sometimes taking the field himself, until forced to accept the Treaty of Campo Formio, by which the empire lost Lombardy and the left bank of the Rhine. Again defeated by France, he elevated Austria to the status of an empire soon after Napoleon had made himself emperor of the French. After Austria took the field against Napoleon for the third time in 1805 and was again defeated, Napoleon dictated the dissolution of the Holy Roman Empire; Francis abdicated his title in 1806. Thus, the ancien régime that had come to an end in France in 1789 ended in Germany also. The year 1809 saw Austria’s fourth unsuccessful war against Napoleon, during which Francis, always distrustful of revolutionary or even popular movements, abandoned pro-Habsburg Tirolese rebels to France and Bavaria. This entry was posted in Uncategorized and tagged 11 August, 1804, Francis II by admin. Bookmark the permalink.